With mediocre action, a plot that is more dull than interesting, and some pretty terrible dialogue, this is a lousy movie. A lousy movie that doesn’t really work on any level other than to keep us moderately interested. The dialogue and story are lousy, but the thing that is most disheartening about this movie is how bad the action is. It’s all CGI, and none of it seems to be choreographed well at all. this movie needed to be done with practical effects, at least some of the way. This is the kind of thing that could have gone directly to dvd, as a B movie. without Keanu Reeves attached that’s probably what would have happened. 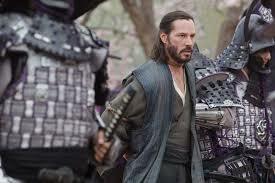 He’s trying to do a tom cruise in the last samurai here, only reeves doesn’t have what it takes. On top of that, the decision to use CG effects the whole way through is a tremendous detriment to anything this movie might have amounted to. There are lots of problems with 47 Ronin, the Keanu Reeves, Japanese samurai film, which is more CGI than it is actual action. That right there is probably the biggest problem of them all. The action is lousy. You go into an action movie not really expecting much from the plot. The same can be said of the dialogue. But when the action is dopey and all just drawings and computer effects, and there is no attempt made at all to hide it, then we have a problem. It’s a real shame that this movie is so uninspired because this is actually the film of the legend. The 47 Ronin are known. In fact, they are the single reason why we know the word Ronin and that it means a samurai without a master. Sure, there was the Deniro spy movie by that title, which was a pretty great film, but the word only exists because of this story where these men without a master went out seeking vengeance. This is the movie of that group of samurai and unfortunately it does not do them justice. For starters, Keanu Reeves is the star and the only name actor in the entire cast. where is ken wantanabe when you need him? how about zhang zhi (I know she’s chinese, not japanese, but her martial arts skills would be reason enough to put her in this film.) tom cruise made the last samurai, a movie about a white soldier in japan getting mixed up with the samurai, but that film had wantanabe in it and also relied on story and practical effects instead of cgi. the wolverine, which also featured a white actor surrounded by a sea of japanase yakuza and samurai, was also better than this film. that’s probably because it was a superhero movie based on previously established material. 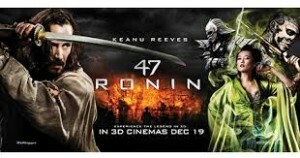 47 ronin does not have that going for it. the story is where the downfall starts. this is simply about a white man, Kai, (reeves) who is known as a half-breed, and found and raised by samurai. the master may love him like a son, but the others who are around his own age don’t treat him very well. and then there’s the beast attack at the beginning. this is the opportunity for the movie to open with something cool. a wild beast that runs out of the woods and that our main characters have chase after and hunt down. this should have been the opening of princess mononoke, only done with live action (as opposed to that film’s animation.) only the beast didn’t work. it looked awful and totally fake. the computer graphics were so poor that the only thing to take away from the scene was how lousy the effects were. the story has samurai master and his soldiers go to see the emperor. there’s going to be a competition where the master will send one of his warriors out for a one on one fight. there is also an evil master and his sidekick, a witch who turns into a wolf, a spider, or just a green robe, flying around in the air. kai notices the wolf with multi-colored eyes and the woman with the same eyes and suspects she’s a witch, but when he tells one the leaders of his clan, the leader dismisses him. this leads to the match between this giant silver samurai (think the ending of the wolverine, only with an actual guy in costume here), and a masked soldier for kai’s clan. when kai finds that the guy who is supposed to fight has been put under a spell, he straps on the armor and face mask and steps up to the plate. the result should have been a cool fight, but it really ins’t . this movie needed some decent choreography. i can’t imagine why they wouldn’t have hired a top asian action director for this, (like john woo), instead of just relying on cgi for everything. when kai is discovered, the master of the samurai klan is forced to take his own life. then the next highest leader of the clan is thrown into a pit for a lengthy period of time. kai is sold into slavery where he is made to fight in front of a crowd. we get a peak at one of the fights he’s in, where he is taking on a giant beast. only the fight is over and done with way too quickly. this should have been a combination of luke skywalker fighting the giant monster in the dungeon of jaba the hut in the return of the jedi, and johny cage fighting goro in mortal kombat. the creature is definitely cool looking, but he is gone in the blink of an eye. kai and the leader now go and find their warriors, who are on the side of a lake, bathing. they plan to seek vengeance for their master. first, they’ll need to get weapons. to do this, they go into a cave, and make a deal with spirits who try to trick them. tis happens to be the only cool scene in the movie. the deal made with the spirits is that kai and his friend cannot draw their swords no matter what. when their men show up and are slaughtered, they are heavily tempted to do just that, but the result of what they do and what we learn of their situation makes it a pretty cool scene. there’s a great surprise lying at the end of it. finally, after what seems like a very long and tiring movie, there is the attack and battle on the enemy. this battle is nothing great (although it was a lot better than the battle of the five armies which ended the hobbit trilogy with a major whimper.) none of these battles has anything on those of game of thrones, a tv show that takes pride in it’s action, battles, and presentation of them. there isn’t a single action scene that has anything cool to offer and this battle is no exception. 47 ronin is a cheap movie. by that i mean it is so bad that it actually cheats. this movie puts a guy with cool skeleton tattoos on the poster, when the guy is in the movie for all of one quick flash of a moment. on the poster he’s holding a gun which he never sports in the film. and he’s certainly not in any action scenes, but just a quick passer-by. keanu reeves is not a great movie star. he’s an actor who is best as when he’s playing a dumb cop, (b movie roles that turned into fun films like speed and point break.) even in the matrix he was out of place, playing a hacker. reeves is a hard guy to pin a film on, but his being the only name actor in the cast certainly didn’t help any. the movie has a lot of problems, but the most devastating one is how little they try to make the action exciting.